Located on the Left Bank, not far from the Luxembourg Gardens and Montparnasse, the Best Western Nouvel Orleans allows you to enjoy an exceptional base from which to roam and discover Paris. The contemporary décor combines with a classic Parisian building that is full of character. Reflecting the Parisian spirit, each room has been carefully appointed and decorated while retaining features of its history. Begin your day with a delicious breakfast before you venture out to Montparnasse station to explore all the sights the city has to offer. 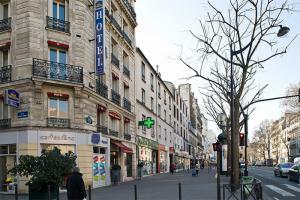 The hotel is about 7 miles from Orly Airport and 16 miles from Roissy-Charles de Gaulle Airport.